Microsoft OneNote is free to use on and sync among all your devices, such as computers, tablets, and phones, as well as on the web. We’ll show you how to use the official Microsoft tool to migrate all your Evernote data into OneNote. 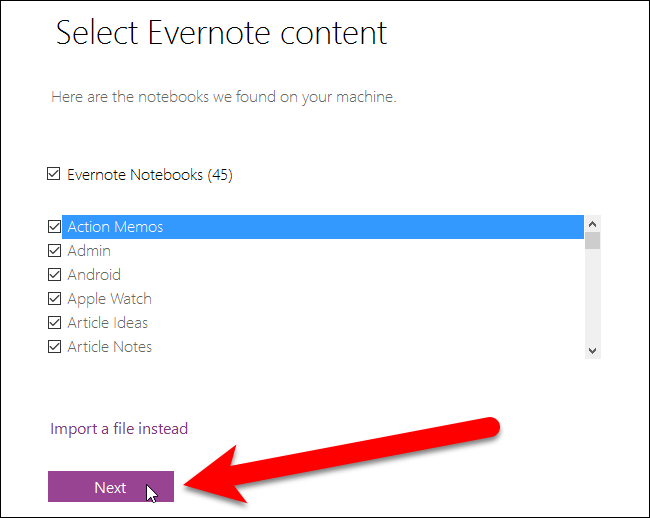 NOTE: You must either have the desktop version of Evernote installed on your computer for this tool to work, or have exported the data from Evernote (as an ENEX file) that you want to import into OneNote. 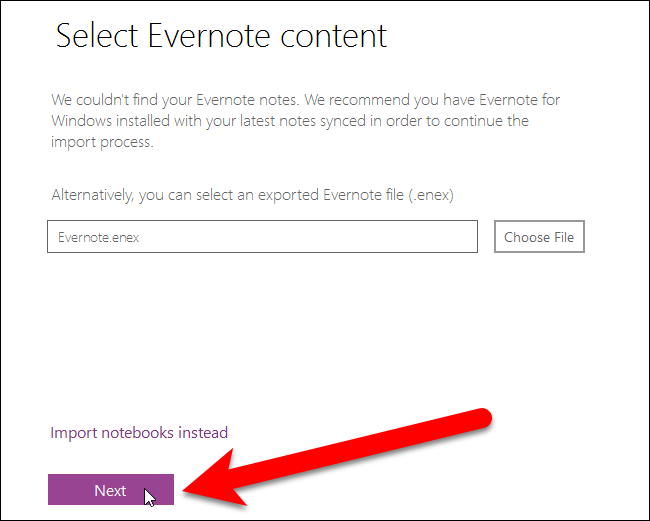 To access your imported Evernote data, you can use either the desktop version of OneNote (for Windows 7 and later) or the free, pre-installed version that comes with Windows 10. Download Microsoft’s OneNote Importer here and double-click the StartOneNoteImporter.exe file. On the welcome screen, check the “I accept the terms of this agreement” box and click “Get started”. 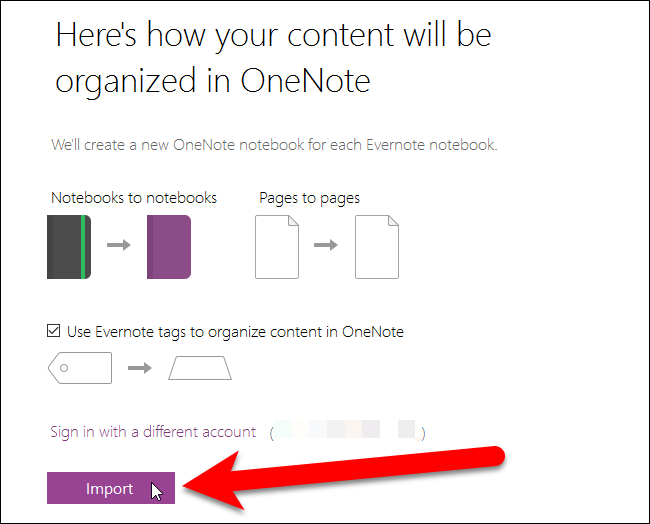 There are two ways to import your Evernote content into OneNote. 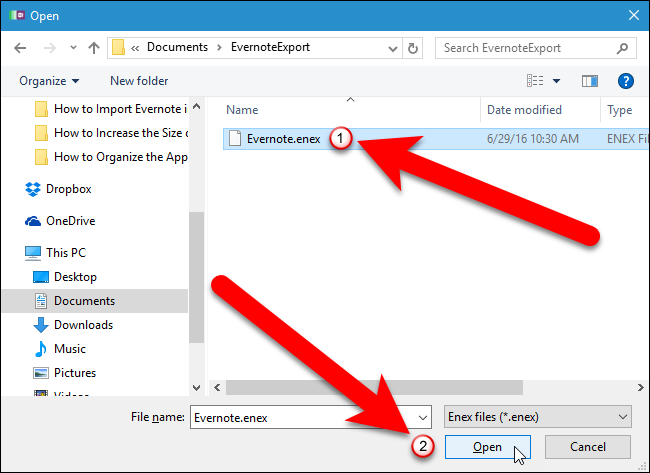 If you have the desktop version of Evernote installed, the OneNote Importer will find the notebooks stored locally on your computer. Be sure that all your latest notes are completely synced. By default, the “Evernote Notebooks” box is checked and all the notebooks found on your computer are checked. 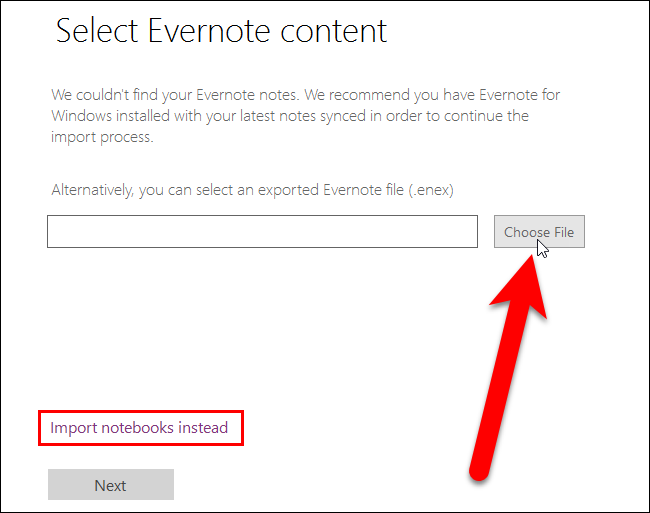 To only import certain notebooks, either uncheck the ones you don’t want to import, or uncheck the “Evernote Notebooks” box to unselect all the notebooks and then check the boxes for the notebooks you do want to import. If you’ve backed up your Evernote data to an ENEX file, you can import the data from that file instead. To do that, click the “Import a file instead” link. If you chose to import your Evernote data from a file, another screen displays. Click “Choose File”. NOTE: If you decide you want to import your Evernote data from notebooks stored locally on your computer instead, click the “Import notebooks instead” to go back to the previous screen. On the Open dialog box, navigate to where you saved the .enex file you want to import, select the file, and click “Open”. Click “Next” to begin the migration process. We chose to import all our Evernote data from our local machine, so we clicked “Next” on the screen for importing notebooks. No matter which method you chose to import your Evernote data, you’ll have to sign in to your Microsoft account to import the data. The OneNote Importer tool imports your data into the Documents folder in your OneDrive account online, not to your local machine. This allows you to more easily access your OneNote data on any device for which OneNote is available (Windows, Apple, Android, or Web). 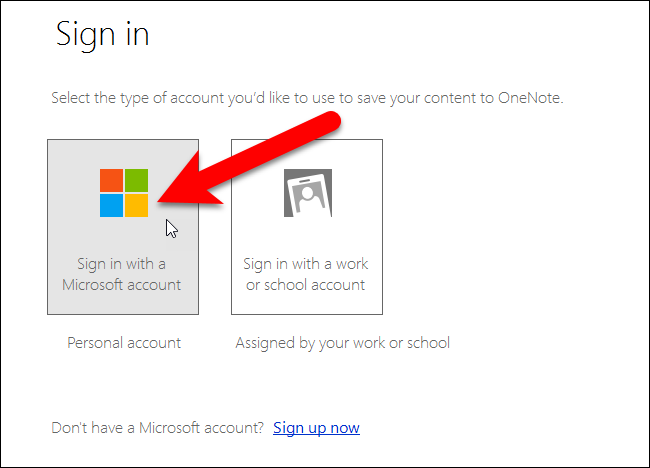 Click the box for the type of Microsoft account you have. 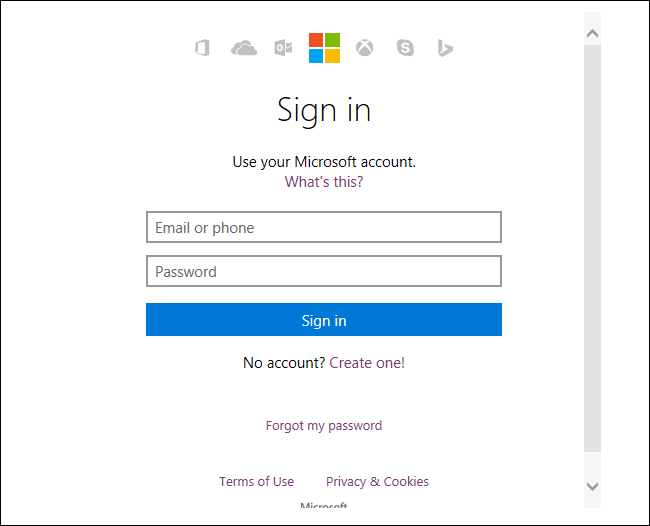 Enter your Microsoft email address and password on the Sign in page. Your Evernote notebooks will become notebooks in OneNote, and the notes in the Evernote notebooks will become pages in the OneNote notebooks. If you’ve added tags to your Evernote notebooks, you can use those tags to organize your notes within your OneNote notebooks. 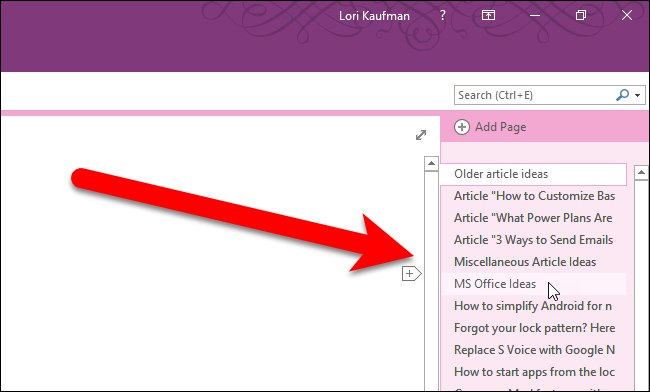 To import the tags with your Evernote notes, check the “Use Evernote tags to organize content in OneNote” box. NOTE: The tags from Evernote are imported as sections within the notebooks. 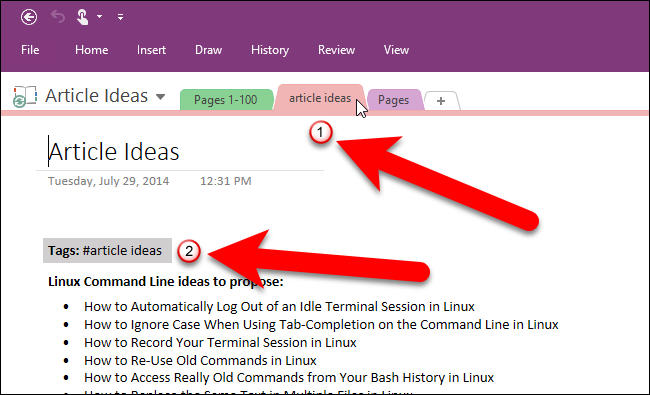 However, the tags are not really integrated into the OneNote tagging system. We’ll talk more about this later in this article. To begin the migration process, click “Import”. The notebooks are created and the notes are imported. 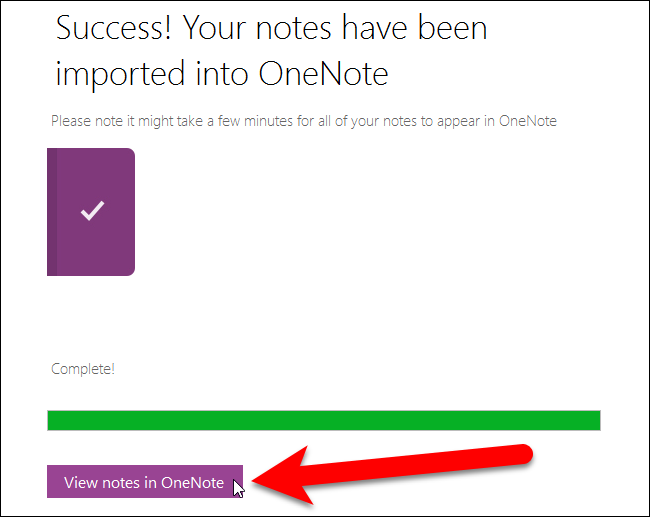 When the migration is complete, click “View notes in OneNote” to open OneNote and access your notes. 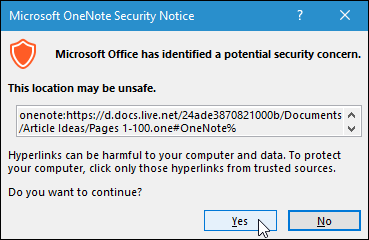 Because the notes are stored in your OneDrive account online, the following Microsoft OneNote Security Notice dialog box displays, warning you that the location may be unsafe. However, your own OneDrive account is a trusted source, so, click “Yes” to continue. 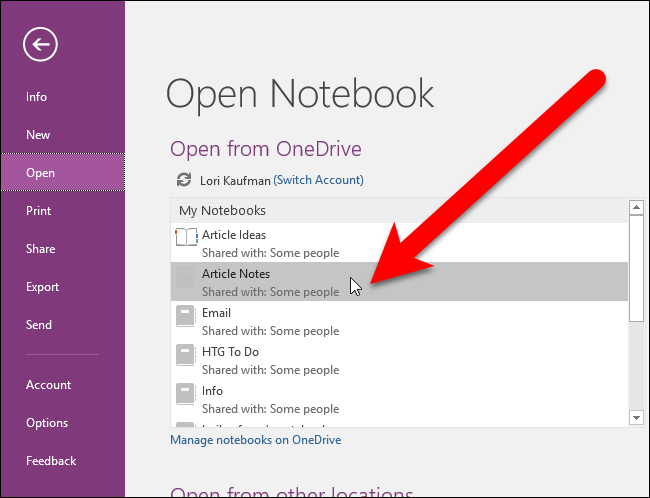 A welcome note is added to the first notebook in the list you imported and that’s the note you see when you open OneNote. To access the rest of your notes in that notebook, click the “Pages” tab at the top of the notes area. It may take a bit of time to load the notes in the notebook, depending on how many notes you have in that notebook. 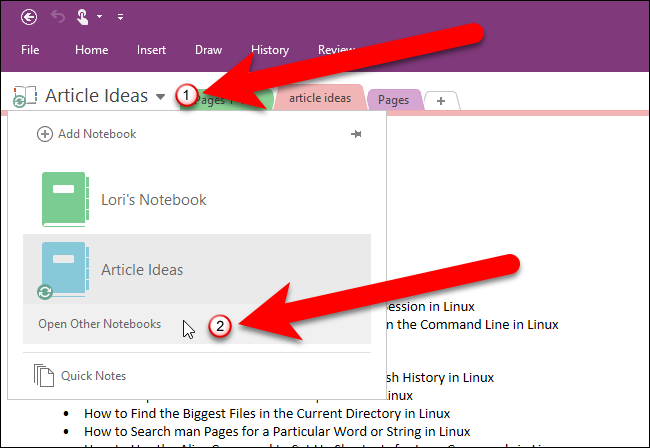 All the notes in that notebook are listed in the right pane in the desktop version of OneNote 2016. Click on any note to access it. 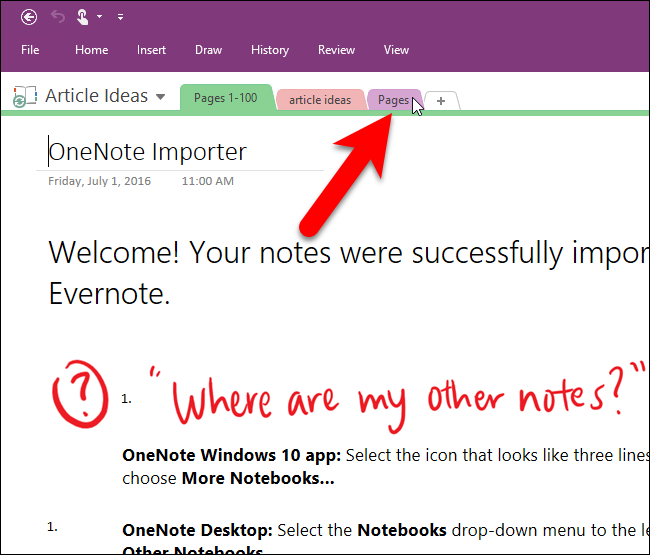 NOTE: If you’re using the OneNote app that comes with Windows 10, the notes are listed in a pane on the left. If there was a tag on a note, that tag becomes a section within the notebook accessed on a tab at the top of the notes area. The tag is also listed at the top of the note text as a hashtag, as shown below. To open another notebook you imported, click on the notebook drop-down list in the upper-left corner of the window. Then, click “Open Other Notebooks”. On the Open Notebook screen, click on a notebook in the My Notebooks list to open it. The first note in the notebook opens. Notice in the example below that there are two tags for the current note, “article ideas” and “htg”. However, only one of those tags was converted into a section in the notebook (the “article ideas” tab). 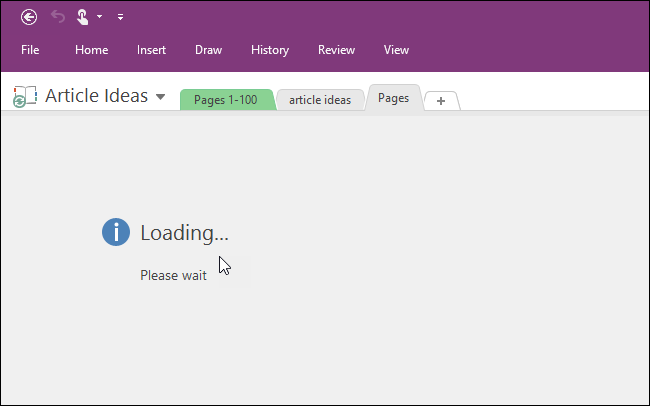 This is a limitation of Microsoft’s OneNote Importer tool. 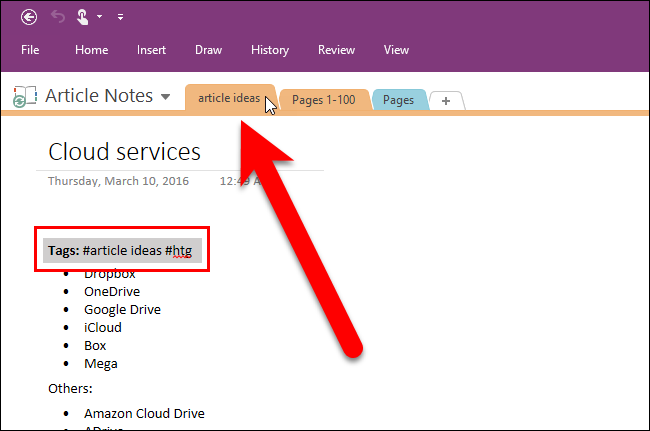 For more information about tags in OneNote, see Microsoft’s support articles about applying a tag to a note and searching for tagged notes. 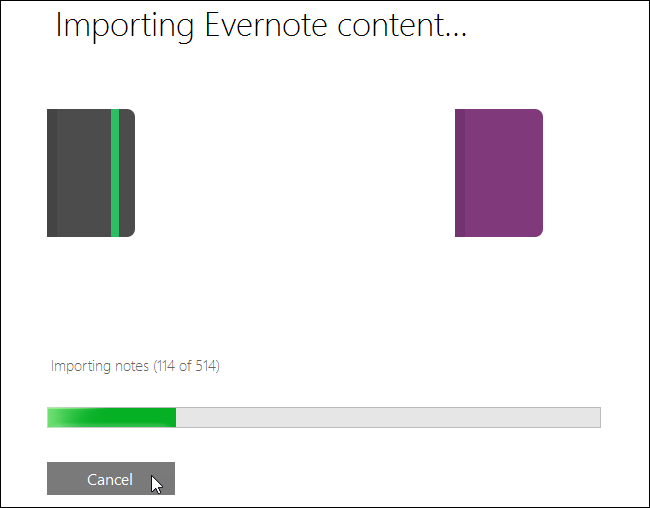 If you really want to preserve all your tags when migrating from Evernote to OneNote, you can migrate using a third-party tool called Evernote2Onenote instead. It will create notebook sections for all your tags in your notes, not just for the first one in each note. However, you may end up with duplicate notes, because a note with multiple tags will be placed in each section created from each of the tags as separate notes. 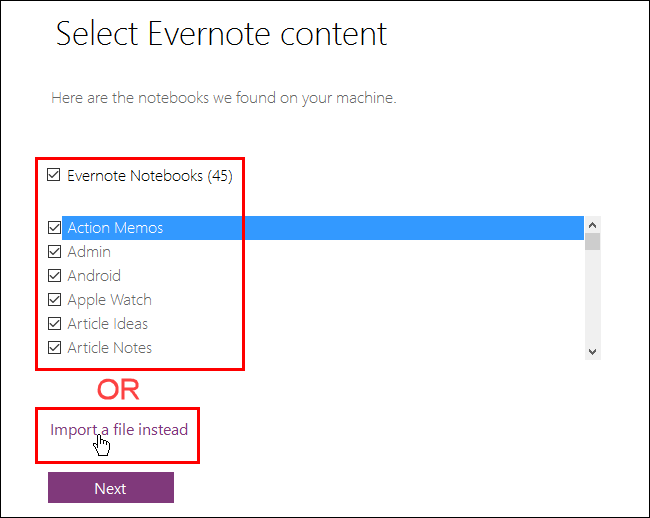 Evernote2Onenote can also only import one notebook at a time, and the notebooks are stored locally when imported. Once you’ve migrated all your notes into OneNote, you can access them on any platform on which OneNote is available (Windows, Apple, Android, or Web). However, there are some limitations in the mobile versions of OneNote. You can add new sections to notebooks in OneNote for iOS and Android. However, while OneNote for iOS allows you to move a section from one notebook to another, OneNote for Android only allows you to move pages between notebooks. 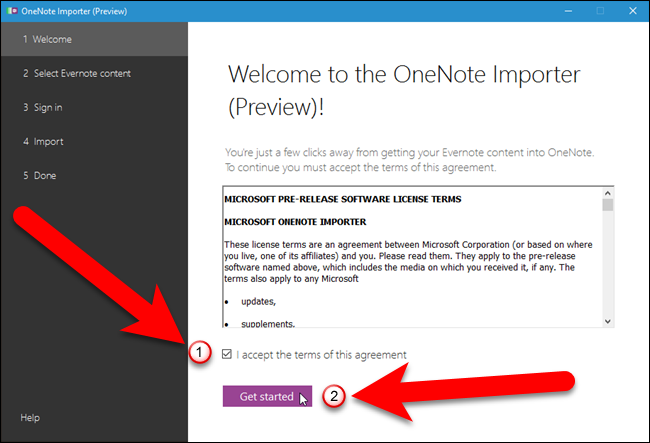 For more information, see our article about the free version of OneNote for the PC and some of the differences between Evernote and OneNote.